The Location of Cash 2 Go is at the corner of N Sierra Way and E 42nd St.
Omnibus’ Bus line #5 has a stop at 40th @ Sepulveda Wb Fs, a hop and a skip away. Get picked up and dropped off at your leisure! Located in a vibrant area, this location neighbors the likes of Lucy’s Mexican Pappasitos, Manna Donuts, and Cardenas Market. Financial troubles are the worst, but how can they be avoided when you’ve got poor credit? Most traditional lending institutions won’t accept applications from people with a credit history that’s less-than-perfect. LoanMart encourages all to apply regardless of poor credit history. Their goal is to provide flexible auto title loans in San Bernardino. They may be able to help you get qualified for up to $30,0001 in funds in as little as one business day3. An auto title loan is a kind of loan that allows the borrower to use the title to their vehicle to receive funds. Customers may continue using their vehicles with no restrictions as long as all monthly payments are made on time. Traditional lending agencies often look at one thing to determine loan qualification: your credit score. LoanMart auto title loans in Wildwood Parkare based on various factors, including your vehicle’s current equity, the number of miles the vehicle has on it, as well as your income and ability to make monthly payments. There are a few different ways to start applying for a LoanMart auto title loan in San Bernardino. Select a contact option below and a friendly and helpful staff member will assist you right away. Click Chat Now to discuss your loan with a LoanMart Agent immediately. Fill out the information request form on this page and wait for a call. 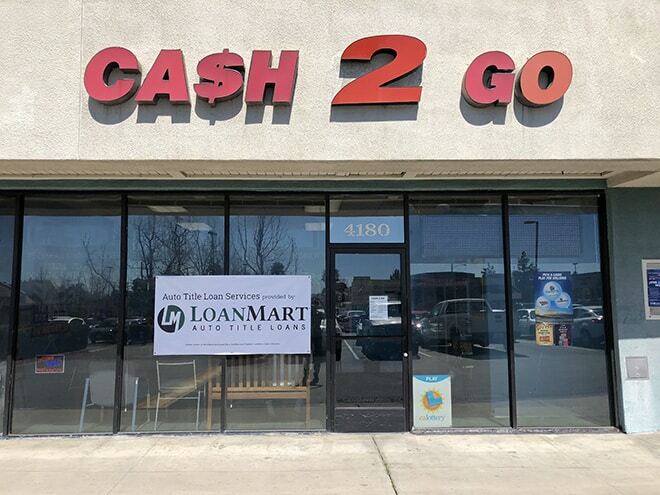 Once you’re approved, a LoanMart rep will talk to you about the loan process and how to get your money, courtesy of LoanMart and Cash 2 Go!